You are here: Home / Kids / Gift Ideas / Board Games for Kids Ages 7 and up! 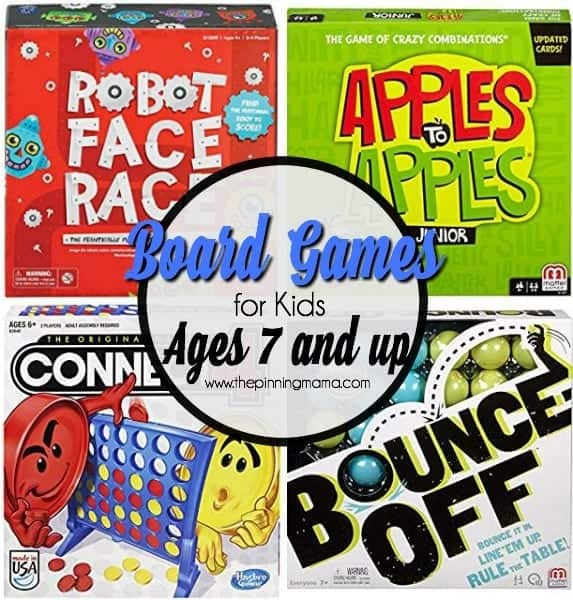 Board Games for Kids Ages 7 and up! With Christmas vastly approaching I’ve decided to put a list of games for kids ages 7 and older. My little girl is 7 and I would love to get her some new more challenging and educational games. It’s fun to see kids grow and want to be challenged when playing games. Connect 4– Win the game by getting 4 of your pieces in a row. This game teaches strategy and problem solving skills. Battleship– In this ultimate battle game search for your opponents ship while trying to protect your own. This game is full of competition, strategy and excitement. Apples to Apples Junior– Similar to the adult version, this is the kid friendly version using comparisons to the judges card. The best or most wild comparison wins. This game is helps to expand kids vocabulary. HedBanz– Kids get to use their heads in more ways than just one by guessing the card on top of their head and displaying the card on top of their head. This game helps with critical thinking skills and help by making up questions and connections to whats on their head. Scrambled States– Players learn the shape, names, and capitals of states through riddles and challenges. This game is a fun way to increase your knowledge of U.S. Geography. Ravensburger Labyrinth– While moving through a constant changing maze, players must find all their objects and characters. This game is sure to awaken the land of imagination in kids. Clue Junior– Kids search to find clues and discover what happened to the missing piece of cake. The Game of Life- Kids get to choose their dream job and follow a wild journey through life. You never know what ups and downs you will encounter on your way. Googly Eyes– Put on vision altering glasses and draw while your team guesses what you are drawing. This game puts a fun twist on drawing, and its fun for all ages. Simon– Try to remember the flashing light sequence and repeat it back correctly. As you get better the intensity and difficulty increases. Ticket to Ride– The object of the game is to travel by train to the most cities in North America in 7 days. Kids take a cross-country adventure in the games. Uno– Kids take turns matching their cards with the current card on top. The first player to get rid of all of their cards wins. This game helps kids develop strategy and matching skills. Robot Face Race– Help the inventor to find the matching heads by looking at their eyes, nose and mouths. Receive a token each time you find the correct robot, and after 5 tokens you win. Bounce-Off– Be the first to re-create the pattern on the board by bouncing your balls and you win. This is a great game to get the fun going at party or game night. Trivial Pursuit Family Edition– All family members can test their smarts in all 6 categories. This game has over 1200 questions so you will never run out of fun. Pictionary– Artist or not this game is sure to bring laughs to the table. The less artistic you are the funnier the game is. Rummikub– Players take turns putting number tiles in runs and groups. This game is easy to learn and reinforces STEM and pattern recognition. Yahtzee– This classic dice game helps kids develop math, critical thinking and decision making skills. Whoever has the highest score in the end wins. Scrabble Crossword Game– Build words and add ups your points in this game. I hope this helps in your search for Christmas presents. It has given me a good idea for my kids. I find that every time my family and I play games we end up laughing all night. I love creating memories that last a lifetime. Nothing is better than on a cold and rainy night than gathering together around the table and playing games. I also have compiled a list of games for Kindergarteners. You can find it here. If you have any games to add please feel free to comment below.